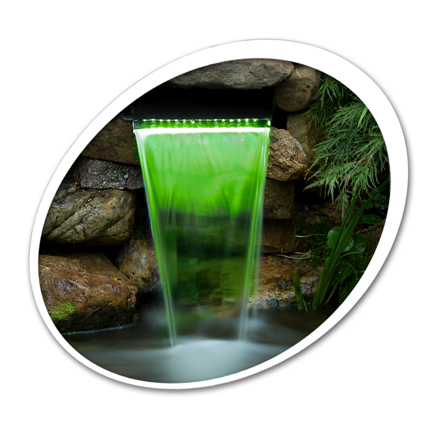 Effective filtration for ponds up to 1000 gallons. Vortex setting chamber helps settle larger solids. The fiber mat filters particles from the water. Ridges on the underside prevent dripping. The extra long spillway makes it easier to hide the filter with stones. Includes adapters for 1" and 1.25" ID tubing. 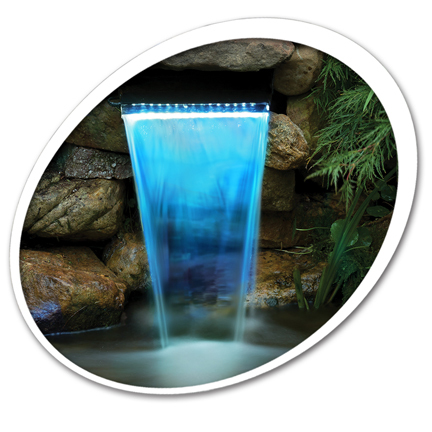 Use underwater or outside of pond or attach to a spillway. ~ One (1) low-voltage Color Changing Waterfall LED Light ~ Transformer: 12 volt output with 120 volt power supply ~ Wireless remote control (requires 2 x AAA batteries - NOT included) ~ Stand and clips included to allow placement in or outside of the pond or to attach to waterfall lip up to 0.25"